"Hawke's Bay" redirects here. 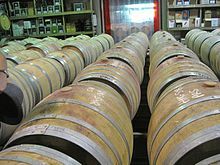 For other uses, see Hawke's Bay (disambiguation). Hawke's Bay Region (Māori: Te Matau-a-Māui) is a region of New Zealand on the east coast of the North Island. 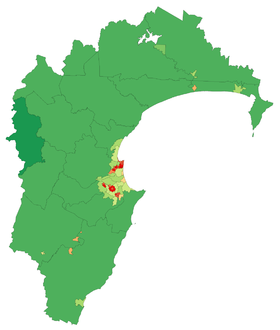 It is governed by Hawke's Bay Regional Council, which sits in the city of Napier. The region's name derives from Hawke Bay, which was named by Captain James Cook in honour of Admiral Edward Hawke. The region is situated on the east coast of the North Island. It bears the former name of what is now Hawke Bay, a large semi-circular bay that extends for 100 kilometres from northeast to southwest from Mahia Peninsula to Cape Kidnappers. 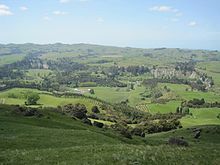 The Hawke's Bay region includes the hilly coastal land around the northern and central bay, the floodplains of the Wairoa River in the north, the wide fertile Heretaunga Plains around Hastings in the south, and a hilly interior stretching up into the Kaweka and Ruahine Ranges. The prominent peak Taraponui is located inland. Five major rivers flow to the Hawke's Bay coast. From north to south, they are the Wairoa River, Mohaka River, Tutaekuri River, Ngaruroro River and Tukituki River. Lake Waikaremoana, situated in northern Hawke's Bay, roughly 35 km from the coast, is the largest lake in Hawke's Bay, the 4th largest in the North Island and the 16th largest in New Zealand. The regional council area consists of the territorial authorities of Wairoa District, Hastings District, Napier City, and its southernmost district, Central Hawke's Bay District, plus the localities of Taharua in the Taupo District and Ngamatea in the Rangitikei District. It does not include the Tararua District, Dannevirke, Woodville or Norsewood, which have been under the Manawatu-Wanganui Regional Council (also known as Horizons Regional Council) since the 1989 local government reforms. In June 2015, the Local Government Commission proposed the amalgamation of the four territorial authorities in the region with the Hawke's Bay Regional Council, but this was rejected in a poll of residents. The region has a hill with the longest place name in New Zealand, and the longest in the world according to the 2009 Guinness Book of Records. Taumata­whakatangihanga­koauau­o­tamatea­turi­pukakapiki­maunga­horo­nuku­pokai­whenua­kitanatahu is an otherwise unremarkable hill in southern Hawke's Bay, not far from Waipukurau. The region's population is 165,900 as of June 2018, 3.4 percent of New Zealand's population. Around 81 percent of the region's population lives in the Napier-Hastings conurbation. Below is a list of urban areas that contain more than 1,000 population. The region has a significant Māori population; 24.3 percent of the population identified as of Māori ethnicity at the 2013 census. A major local Māori tribe is Ngāti Kahungunu. Around 50.5 percent of Hawke's Bay's population affiliate with Christianity at the 2013 Census, making it one of two regions in New Zealand (the other being Southland) with a majority Christian population. Bay whaling stations operated on the shores of the bay in the nineteenth century. On February 3, 1931, Napier and Hastings were devastated by New Zealand's worst natural disaster, an earthquake measuring 7.9 on the Richter magnitude scale, which killed 256 people. Napier rebuilt and now the city is world-famous for its Art Deco buildings, and celebrates its heritage each February with the Art Deco Weekend. MTG Hawke's Bay, formerly Hawke's Bay Museum and Art Gallery, has an exhibition on the earthquake, its causes and impact. The GDP of the Hawke's Bay region was estimated at $7.4 billion as of March 2017, 3% of the national GDP. The climate is dry and temperate, and the long, hot summers and cool winters offer excellent weather for growing grapes. Missionaries in the mid 19th century planted the first vines in Hawke's Bay and it is now becoming an important place for full bodied red wines. As of January 2010, there are an estimated 75 wineries located across Hawke's Bay. https://www.nzherald.co.nz/the-country/news/article.cfm?c_id=16&objectid=12020171 Hawke's Bay is home to New Zealand's first space launch complex, Rocket Lab's orbital launch site (known as Launch Complex 1) on the Mahia Peninsula in Wairoa District. Wairoa District is home to 'Space Coast New Zealand' - that stretch of Wairoa district's coastline from which space launch viewing can be undertaken. Rocket Lab anticipates launching its 17m Electron vehicle early in 2017. Hawke's Bay is one of the most seismically active regions in New Zealand and has experienced many large and often damaging earthquakes. More than 50 damaging earthquakes have rocked the region since the 1800s. Some of the more notable are listed below. The region is served by a variety of radio stations including Radio Kahungunu, The Hits 89.5, More FM, access station Radio Kidnappers and local station Bay FM. As well, most of the national commercial and non-commercial operators have transmitters covering the region. Hawke's Bay also has its own TV station, TVHB, which provides a mix of news and information programmes hosted by local personalities. Hawke's Bay produces some of New Zealand's finest wines and once a year Harvest Hawke's Bay celebrates the fact by offering a three-day wine and food festival. This event attracts many thousands. As throughout New Zealand, rugby union is the most popular sport. The Hawke's Bay Magpies play in New Zealand's annual professional domestic rugby union competition, the Mitre 10 Cup. The team represents the Hawke's Bay region in provincial representative rugby, and draws its players from the constituent clubs who are affiliated to the provincial union. The team play their home matches in McLean Park in Napier. Players representing Hawke's Bay are also eligible to play for the Hurricanes in the annual transnational Super Rugby competition. Hawke's Bay has produced a number of notable All Blacks, including Cyril Brownlie, Maurice Brownlie, Mark Donaldson, and more recently, Bryn Evans, Greg Somerville, Hikawera Elliot, Zac Guildford and current All Black Israel Dagg. The Hawke's Bay Hawks compete in the New Zealand National Basketball League. ^ Pollock, Kerryn (15 November 2012). "Hawke's Bay region – Local government boundary changes". Te Ara – the Encyclopedia of New Zealand. ^ Pollock, Kerryn (15 November 2012). "Hawke's Bay region – Government, education and health". Te Ara – the Encyclopedia of New Zealand. ^ Lunn, Annette (9 June 2015). "Hawke's Bay to amalgamate councils". Newstalk ZB. ^ Henderey, Simon (15 September 2015). "Hawke's Bay voters reject five-council amalgamation proposal". The Dominion Post. Retrieved 23 March 2019. ^ Cite error: The named reference NZ population data was invoked but never defined (see the help page). ^ "2013 Census QuickStats about culture and identity – data tables". Statistics New Zealand. 15 April 2014. Retrieved 25 January 2016. Note some percentages (e.g. ethnicity, language) may add to more than 100 percent as people could give multiple responses. ^ "A magnitude 7.6 earthquake occurred 35 km east of Taihape, New Zealand on Sat Jul 8 1843 5:09 PM. The quake was 12 kilometres deep and the shaking was severe close to the quake". ^ "A magnitude 7.5 earthquake occurred Within 5 km of Waipukurau, New Zealand on Mon Feb 23 1863 12:39 AM. The quake was 25 kilometres deep and the shaking was severe close to the quake". ^ "A magnitude 5.8 earthquake occurred 35 km south of Gisborne, New Zealand on Tue Sep 14 1875 11:39 PM. The quake was 25 kilometres deep and the shaking was strong close to the quake". ^ "A magnitude 7.0 earthquake occurred 20 km south-west of Porangahau, New Zealand on Tue Aug 9 1904 10:20 AM. The quake was 16 kilometres deep and the shaking was severe close to the quake". ^ "A magnitude 6.7 earthquake occurred 45 km north-west of Napier, New Zealand on Wed Jun 29 1921 1:28 AM. The quake was 80 kilometres deep and the shaking was severe close to the quake". ^ "A magnitude 6.2 earthquake occurred 10 km south-west of Porangahau, New Zealand on Wed Feb 12 1930 6:22 PM. The quake was 33 kilometres deep and the shaking was severe close to the quake". ^ "A magnitude 5.8 earthquake occurred 20 km north of Napier, New Zealand on Tue Feb 3 1931 8:41 PM. The quake was 25 kilometres deep and the shaking was strong close to the quake". ^ "A magnitude 6.4 earthquake occurred 15 km south-east of Wairoa, New Zealand on Sun Feb 8 1931 1:44 PM. The quake was 60 kilometres deep and the shaking was severe close to the quake". ^ "A magnitude 7.3 earthquake occurred 50 km south of Wairoa, New Zealand on Fri Feb 13 1931 1:27 PM. The quake was 30 kilometres deep and the shaking was severe close to the quake". ^ "A magnitude 5.9 earthquake occurred 45 km east of Napier, New Zealand on Thu May 5 1932 7:54 PM. The quake was 12 kilometres deep and the shaking was strong close to the quake". ^ "A magnitude 6.9 earthquake occurred 15 km north-east of Wairoa, New Zealand on Fri Sep 16 1932 1:25 AM. The quake was 12 kilometres deep and the shaking was severe close to the quake". ^ "A magnitude 7.2 earthquake occurred 5 km east of Pongaroa, New Zealand on Mon Mar 5 1934 11:46 PM. The quake was 12 kilometres deep and the shaking was severe close to the quake". ^ "A magnitude 6.3 earthquake occurred 30 km south-west of Wairoa, New Zealand on Thu Mar 15 1934 10:46 PM. The quake was 25 kilometres deep and the shaking was severe close to the quake". ^ "A magnitude 6.0 earthquake occurred 30 km north-west of Hastings, New Zealand on Mon Feb 26 1940 6:16 PM. The quake was 25 kilometres deep and the shaking was strong close to the quake". ^ "A magnitude 5.8 earthquake occurred 45 km north-west of Wairoa, New Zealand on Wed Mar 1 1950 6:58 AM. The quake was 60 kilometres deep and the shaking was moderate close to the quake". ^ "A magnitude 6.2 earthquake occurred 35 km east of Porangahau, New Zealand on Sat Feb 10 1951 3:27 PM. The quake was 33 kilometres deep and the shaking was strong close to the quake". ^ "A magnitude 5.7 earthquake occurred 5 km south of Hastings, New Zealand on Mon Oct 6 1980 3:32 AM. The quake was 30 kilometres deep and the shaking was strong close to the quake". ^ "A magnitude 6.2 earthquake occurred 20 km north-east of Pongaroa, New Zealand on Mon Feb 19 1990 6:34 PM The quake was 34 kilometres deep and the shaking was severe close to the quake". ^ "A magnitude 6.4 earthquake occurred 15 km south-west of Porangahau, New Zealand on Sun May 13 1990 4:23 PM. The quake was 30 kilometres deep and the shaking was severe close to the quake". Wikimedia Commons has media related to Hawke's Bay Region. Wikivoyage has a travel guide for Hawke's Bay.